2014 to 2018, and onwards... starlings - a persistent hand-tame pair of youngsters. One still around into 2015, and herself nesting in the garden. Two probable decendants still visiting in 2018. 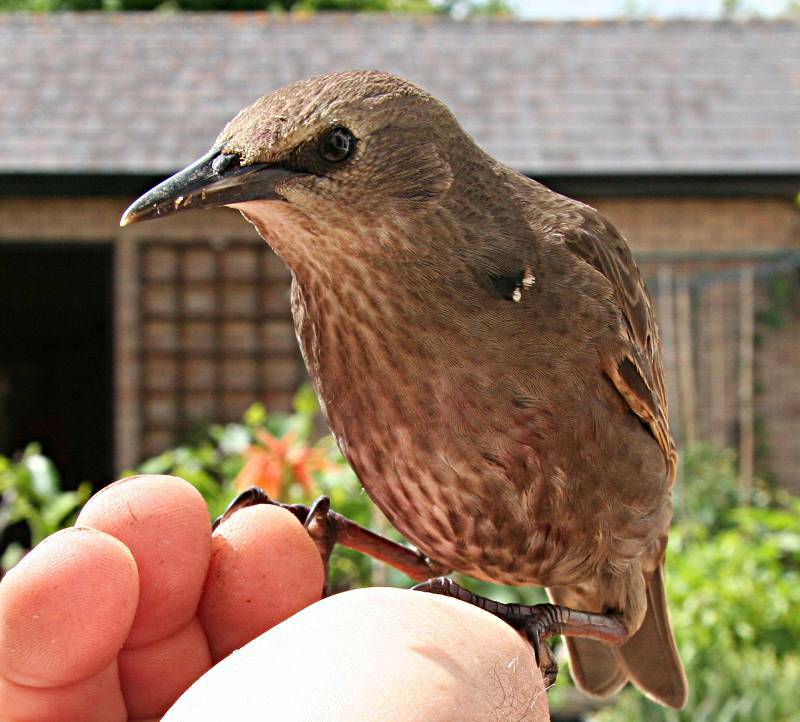 2013 starlings - one hand-tame youngster quickly became more which I couldn't distinguish. Latest news (2012 October 6th) further down the page. As reported on my Swifts page, in 2012 a pair of starlings nested in a hole I'd made in the soffit at the eaves of the house. The hole was intended for swifts, which so far hadn't found it, but in 2011 a pair of swifts had occupied a nestbox very close by, so when the swifts returned in 2012, the starlings displayed their natural instincts to try to obstruct the swifts, as both species can compete for the same nest-spaces. The first brood of starlings fledged around 2012 May 10th, so I thought that they'd stop worrying the swifts, but instead the starlings immediately set about raising a second brood, which fledged around 2012 June 26th, so the swifts finally were left alone. 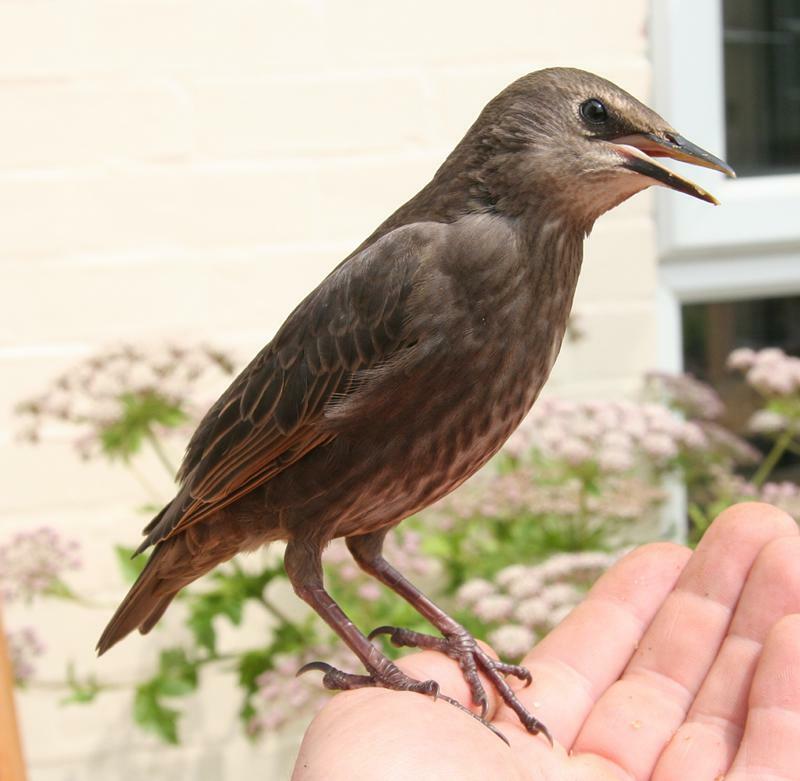 Meanwhile, a young starling which I assume was one of the first brood discovered the dried mealworms which I was really putting out for blackbirds to feed to their young. It took very little encouragement before the starling was taking the mealworms from my hand, indeed following me round the garden, landing on me, and probing sleeves and fingers in the hope of food - I can see the way they use their beak - poke into a promising place, such as the lawn, then open to see if there's anything in the hole. 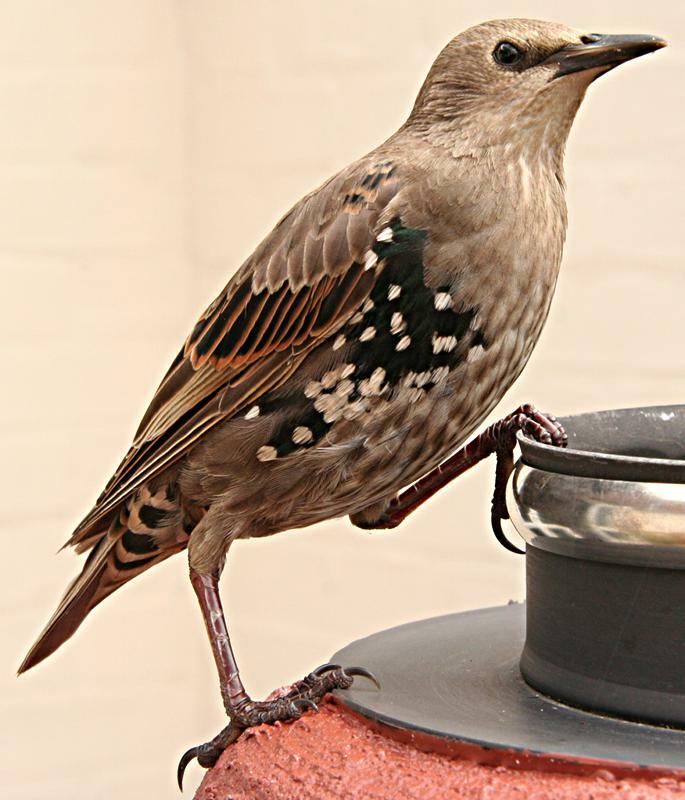 I nicknamed 'her' "Stella", as that seems to me the ideal name for a starling, but it seems there is almost no way to determine whether a young starling is male or female. My first photo of the young "Stella", a day or two after getting into the habit of taking food from my hand. As I say above, it is likely that she fledged on 2012 May 10. 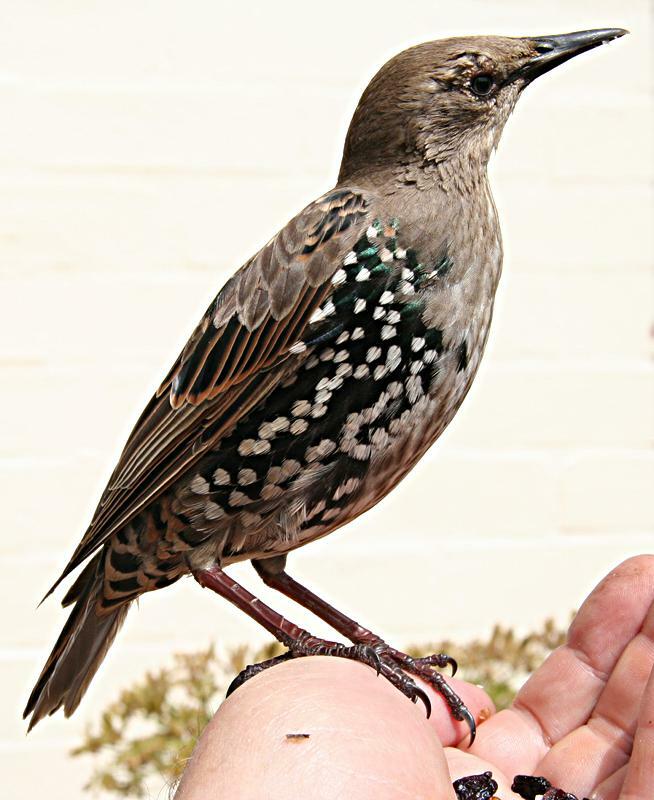 5 weeks later than the photo above, and some more adult feathers are starling to show, with a yellowish edge (websites say this coloured edged soon abrades away). Also the first sign of the iridescent green colour shown by adults, with just a tiny patch. And another the same day. "I'm not posing all day - give me a mealworm!". Just a few days later - the adult plumage has developed further in that short time. After 9 days with no appearances, "Stella" turned up again, initially a bit nervous of me, but soon back into old habits. Yet more of the green with white spots showing. Another the same day. The visits are a lot more 'purposeful', by which I mean that she comes for food, and when she's has enough flies off again. No longer just landing on me 'for fun' as in the early days. This time, there was a gap of 2 weeks with no sightings. 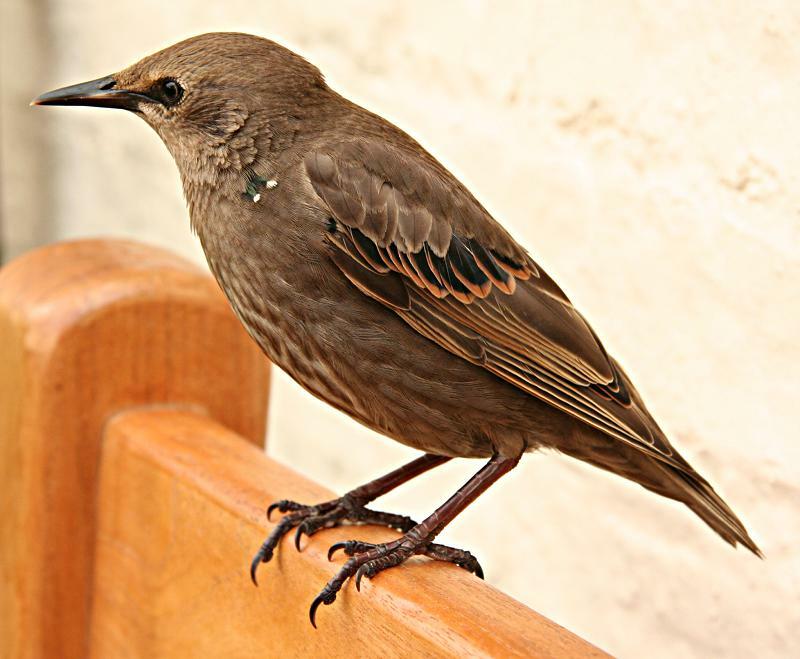 I thought I'd seen the last of her, but then: a juvenile starling eating the mealworms on the bird-table; didn't fly off when I stepped outside (they usually do); it's her again, and what a change in the plumage! As after the previous gap, she was initially a bit nervous of me (but not enough to fly away) but again was soon taking food from the hand. Another photo the same day. Raisins are among the favourite foods. 2012-October-6 No more visits from "Stella" since August 29th. 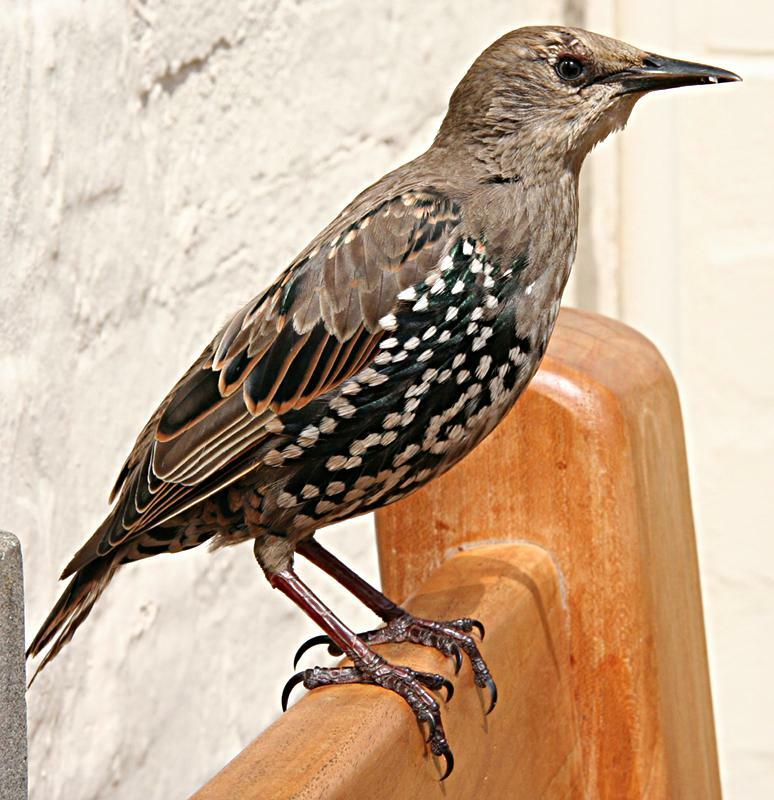 There have still been starlings at the bird-table from time to time, but no noticeably tame ones. If she's among them, then she's reverted to more 'normal' starling behaviour i.e. fly away if I open the door. 2012-August-30 "Stella" has still been visiting, though not so far today. Yesterday, she turned up with a tick attached near her head. 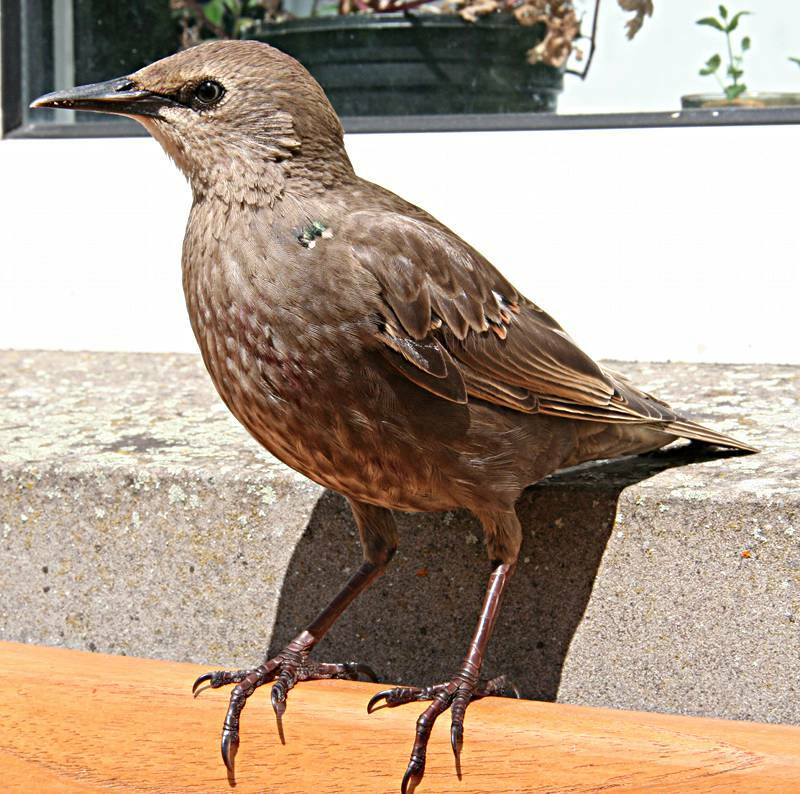 It must be quite common - one of the young blackbirds had one a week or two ago, but it was gone by the next day. 2012-August-26 "Stella" made at least 3 visits today, and perhaps more that I didn't notice, to check whether I'd put any mealworms on the bird-table (there are peanuts on there, but she's not very interested in those). One visit at 3.30pm - I've never known it so late in the day. As usual, she'll come and land on my hands to feed if encouraged, but I don't think she'd bother these days if there was food on the bird-table. The 'sore' over the right eye seems to have cleared up completely. 2012-August-22 "Stella" continues visiting most days - in the morning, as usual. In the August 3rd photos above, although I didn't spot it at the time, you can see a bit of a 'sore' above the bird's right eye. It got worse for a while after that, but now seems to be returning to normal. I must start making plans for some starling nest-boxes for next year, as I think that letting them use spaces so close to the swifts will just lead to even more aggression. 2012-August-17 An early morning visit again. Food offered (and quickly taken) is just what also suits the two young blackbirds: dried mealworms, currants, and sultanas, plus maybe cheese which is definitely the first thing to be taken. 2012-August-16 "Stella" continues visiting - often just quickly takes food from hand, and flies away, but maybe getting back to old behaviour of sticking around a bit longer. The starling is clearly 'the boss' over the two young blackbirds, despite being smaller. 2012-August-13 "Stella" continues visiting. 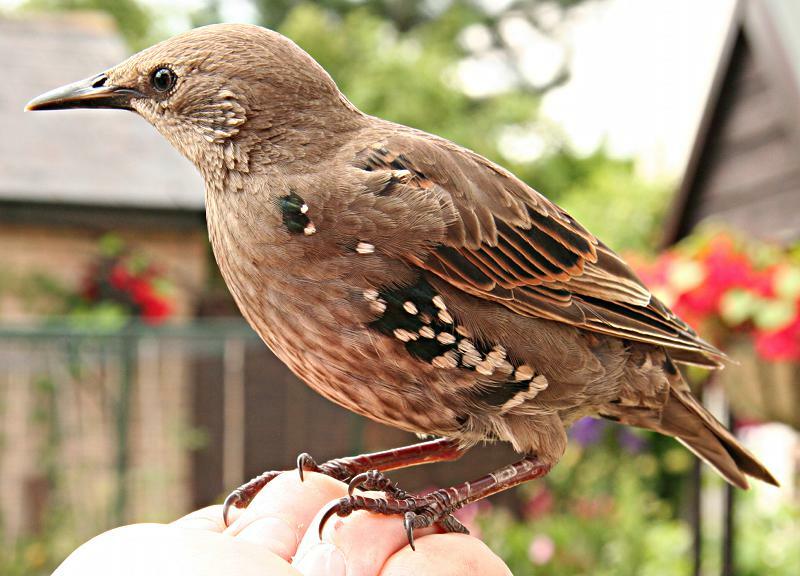 Today turned up with another similar-looking juvenile starling, which of course doesn't know me and wasn't having me anywhere near. "Stella" has never been very vocal so far, but for the last couple of days has taken to 'squawking' a bit. And a few days ago was showing interest in the swift nest-boxes (one still occupied by swifts), but hopefully entrance too small for a starling). 2012-August-4 "Stella" the starling has visited for 3 consecutive days, usually in the morning, sometimes into early afternoon, but never any later than that. As perhaps you'd expect from a type of bird that eats almost anything, she apparently enjoys: dried mealworms, cheese, blueberries, and raisins, but doesn't like blackcurrants (do any birds? they are usually left on the bush). 2012-August-1 It's now 10 weeks or so since I first got to know this starling. Certainly a fun experience for me. How long will it continue?